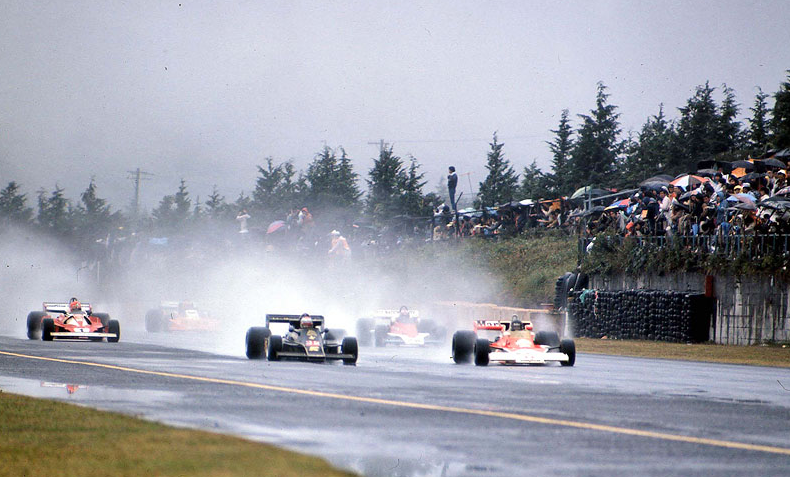 The rain-soaked start of the 1976 Japanese Grand Prix, with James Hunt (11) leading Mario Andretti (5) and Niki Lauda (1). 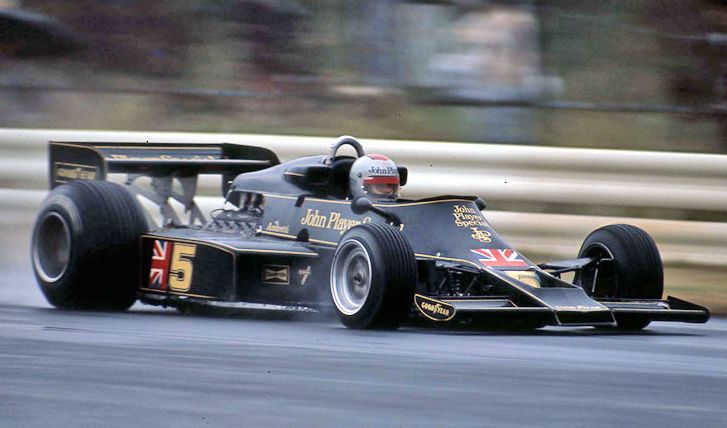 Andretti had qualified his John Player Special Lotus 77 on the front row, along side pole position winner James Hunt, in a Marlboro-sponsored McLaren M23. In the second row was Niki Lauda, the series points leader, in a Ferrari 312T. This was the season finale; Hunt needed to gain four points on Lauda – a tough order in when points were awarded on a 9-6-4-3-2-1 scale, with no points earned below sixth place. The World Championship was on the line. So were the lives of the drivers. Hunt, speaking boldly at the drivers meeting, said he wouldn’t race in such conditions. Many agreed with him, although several broke ranks and said they would. The organizers said there would be consequences, if the race were called off. 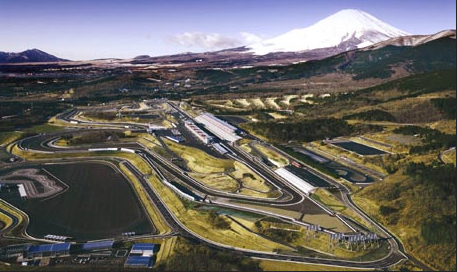 Fuji International Speedway, with sun. But the drivers caved. The time set for the start – 3 p.m. local time – was actually already 90 minutes behind schedule, and only two and half hours before darkness. 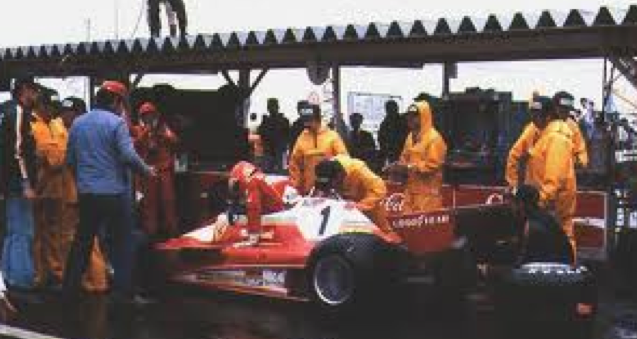 Then it started to rain even harder; incredibly, the drivers were ordered to get into their cars for the start. “Amazing, amazing decision. Just getting into the car was an awful experience,” Andretti said. “You like to try and at least keep your feet and your shoes dry, so they don’t slip on the pedals. Nope, you couldn’t even do that.” Andretti slid down into a puddle in the seat of his Lotus; his shoes were filled with water. Inside his helmet, it was fogging up. His uniform was soaked through to his underwear. Out on the front straightaway, the visibility was less than 200 yards. Green! Hunt got a ferocious jump on Andretti off the line, and went rocketing down the main straight, kicking up a rooster tail of spray, blinding those behind him. No. 3 starter John Watson nearly spins. The spray was the worst at the beginning of the race. “After that, the cars started to string out,” Andretti said. Speeds were barely above parade level. “Poor Niki, he suffered terribly” Andretti said. “It was fogging up inside his helmet, in addition to the spray. He had all those burns around his eyes, and he was getting a lot of tearing. He had, like, three per cent vision. I felt so bad for him. 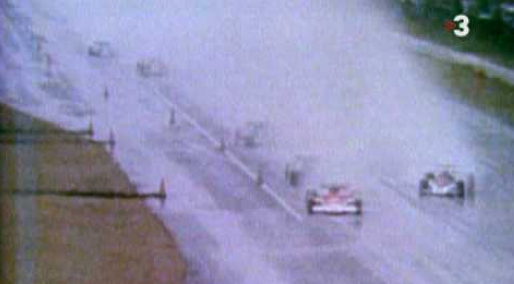 It was just as courageous for him to pull off as it was for the others to stay on.” Three other drivers also quit. 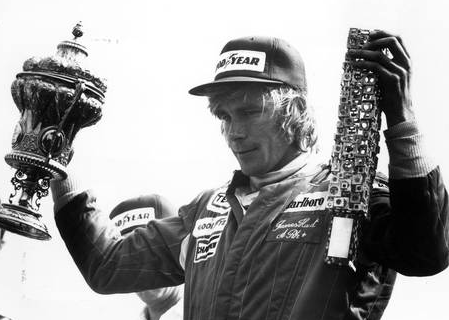 With Lauda out, Hunt’s mission became more clear: Finish in the top three, to score enough points to overtake Lauda and be crowned World Champion. “When things sorted out a little, and there was not as much spray, you could at least see where the puddles were,” Andretti said. But the racing was still treacherous. Andretti decided he was going to go the speed he felt most comfortable at, and no more. If that was good enough for a top placing; so be it. If not, tough. Then, an unexpected thing started to happen. The rain stopped. Even a few rays of sun peeked out. The track started to dry. This was a problem; the cars had all soft rain tires fitted to them. On a wet track, they gave tenacious grip. On a dry one, they got hot, and started to shed chunks of tread. Hunt, going fastest, had the most trouble. Andretti decided to save his tires by maintaining a lower speed, and by trying to aim for the puddles he had previously been avoiding. The water would cool the treads, and help preserve them. Hunt was frantic to know what he should do. Other drivers were experiencing tire failures. He finally drove into the pits and asked for new tires; in the process, he gave up the lead with just 12 laps left in the 73-lap event. 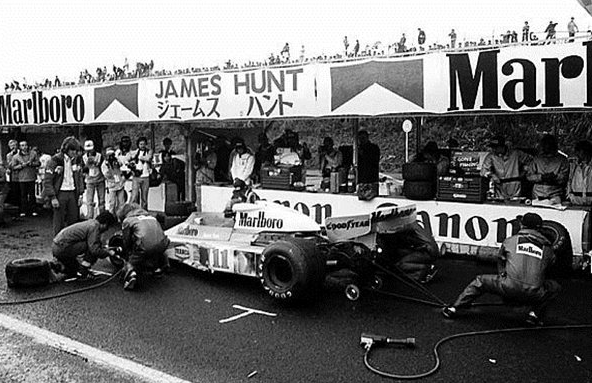 Tire changes took much longer in those days, and Hunt lost an entire lap in the process of getting pit service. When he returned to the track he didn’t know where he was in the order – as it turned out he was in third, which was good enough to win the title – but he didn’t know any of that. He drove like a madman. Patrick Depailler, in the six-wheeled Elf Tyrrell P34, took the lead for two laps. But more tires, more tire problems. His tires worn to the cords – which he could see from the cockpit – he slowed dramatically to at least salvage second place. Andretti streaked by into the lead. He knew it too; the spray was gone now, and he had been able to catch sight of the track’s scoreboard. Hunt, meanwhile, was still racing blind. Hunt jumped out of his car in the pits after the race, and started berating his crew. They were all jubilant, however, because they knew what he didn’t: Hunt was World Champion. Was it as good a story in real life, as it was portrayed in “Rush” – the movie about it all? « How Much Is A Shelby GT500 Super Snake Worth? I am just watching Rush for the first time and going back and forth between the film and YouTube clips. I can’t believe how accurate everyone alive says the film is.